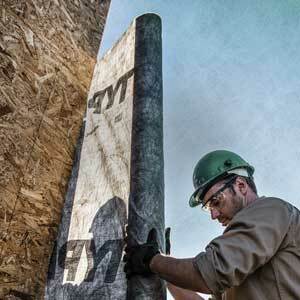 Installing products properly is critical in order for an air barrier system to work as intended. The requirement for continuous air barriers was added to the International Energy Conservation Code (IECC) for the 2012 version. Consequently, the use of air barriers in commercial construction is growing, driven by building codes and increased awareness of how air barriers support sustainable, comfortable buildings. However, not all air barriers are equal in performance or design, and there is not one solution suitable for all climates, regions, and project conditions. Gypsum board, liquid-applied membranes, sprayed polyurethane foam (SPF) insulation, and polyethylene or polypropylene building wraps are all examples of air barrier materials. The use of building wraps as air barriers is covered in The Construction Specifier’s latest e-book “Exploring Air and Water-resistive Barriers.” This four-part, sponsored e-book takes an in-depth look at the building envelope, with a particular focus on managing air movement and moisture. Readers can learn why airtight standards for energy efficiency have created new challenges for moisture management, and the potential implications of various compliance approaches to recent code changes. Learn how controlling air, vapor, and thermal transfer help mitigate moisture problems within the building envelope. The e-book also covers trends found during the testing of tapes and flashings, particularly as they relate to adherence, durability, and the products’ ability to accommodate movement.